A movie that truly showcases what makes Robin Williams so special, this one is Private Parts meets Patch Adams, and the war time setting really works for the somewhat familiar story. A very enjoyable movie, this one is all Robin Williams, all day long. With other movies that Williams has been great in, there are a whole host of reasons and help surrounding the actor, for why the movie turned out great. With this movie, it is all Williams. He has to do this radio show again and again, and each time be witty and fast talking and think on the edge of his seat, about what’s coming next. His impressions are pretty funny, even today, more than thirty years later. And the movie is about his act and his conflict with the higher ups who can’t stand it. We’ve seen this sort of thing before, where the funny guy keeps getting in trouble with the authority figures who want him to get serious, (Williams did it himself, with Patch Adams,) but Good Morning Vietnam does it by placing this character right in the middle of the Vietnam War, in a foreign country, during a time of bombing and mass killing. The movie wisely uses the war to factor into the plot, (as opposed to just letting the war exist in the background.) Cronauer goes from one conflict to the next, jumping through hoops to oppose the men who want him thrown off the air. The conflicts and characters are both pretty great, making this a very entertaining film. Like Steve Martin, Robin Williams was one of the greats of American comedy in the eighties and nineties. From the Birdcage to Mrs. Doubtfire to Aladdin, he was a dominating force to be reckoned with. 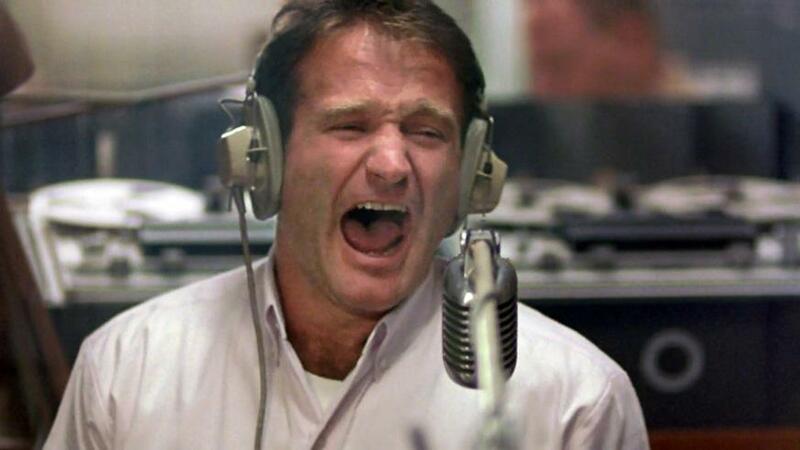 And Good Morning Vietnam was perhaps the movie that showcased his talent more than any other. 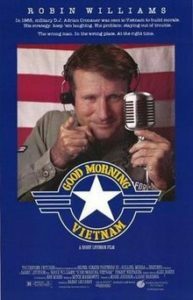 It’s a movie where Williams plays a radio disc jockey (a DJ) over in Vietnam during the time of the war and uses humor over the radio to try to give the young men fighting something to laugh about. Of course, his brand of humor gets him in trouble in all sorts of ways. Only here, unlike other movies that have the same idea, (such as Patch Adams,) Williams is actually funny and not gimmicky at all. What he does behind the microphone is all natural talent, and it’s the kind of thing that proved just how creative and skillful this guy really was. Williams plays Adrian Cronauer in the movie, a man who is brought in to dispense humor, yet quickly learns that over here, working for the military, even that has to be defined and follow orders. The first thing he finds unusual is that there is a specific list of songs he is allowed to play. Despite this, Cronauer’s booth contains a wall of records, most of which are not on the list, and he gets to work right away, looking through them and picking out the ones he likes. He doesn’t care about the military’s list, or most of their other rules either. He’s there for one reason only. To be funny. This gets Cronauer into hot water early on with two different characters of a higher ranking. There’s Lieutenant Steven Hauk, (Bruno Kirby,) who oversees the business at the radio station, and then there’s Seargent Major Dickerson, (JT Walsh, so great at playing a villain,) who is way higher up than either of these guys and makes no effort to hide his resentment. Both of these villains despise Cronauer’s act and find it distasteful and disrespectful. Luckily, there’s a man who is higher than either one of them, and he’s the big boss of the entire military station. This is General Taylor, and while he does from time to time side with the boys who want Cronauer kicked out, for the most part, he’s the voice of reason and understanding. He’s the guy who admits that he finds Cronauer funny and right about a lot of issues. It’s Cronauer’s act that he performs on the air, that gets these two villainous characters all riled up. At least at first. He talks at a pace of a mile a minute and does all kinds of sound effects and impersonations. He does different voices for different characters and constantly pretends to be bringing known celebrities, (mostly of politics,) into the studio. Cronauer makes jokes about Ho Chi Minh and Vietnam, and he even does impressions of President Richard Nixon. To Cronauer, nothing is off limits. He goes as far as to make fun of Nixon’s daughters and how ugly they are, at one point. And we get to see all of his colleagues laughing hysterically, in the booths surrounding him, as they listen. We also get to see Hauk listening in his office, and going nuts at every joke he hears. What’s entertaining is that we have two villains who are very different in their status and therefore their relationships with the other men. Hauk is the comedic villain. He’s the guy who has an assistant that follows him around, but is constantly correcting him and showing him that he’s wrong about things. At one point the assistant stands in the way, when Hauk is trying to leave the room, and it becomes a whole big thing that Hauk has to speak to him about afterwards. This is a guy who gets no respect and admits it, telling the other men it’s not right that they never salute him, since he is in fact a higher ranking officer than any of them. With Dickerson, on the other hand, there is no laughing at all. The very first time he meets Cronauer, he berates the DJ and yells at him to the point where Cronauer can’t even get a funny remark in or look the man in the face. The contrast of these two villains is pretty entertaining. But the story of the movie needs more than just radio DJ who is constantly getting into or out of trouble. That’s what brings in the romantic angle. Cronauer sees a girl in the street, walking by him one day, and decides that he is in love. He follows her to an English class and then pays off the teacher to let him teach the class instead. How this works, exactly, is a little unbelievable, (are we to believe that Cronauer just paid the man enough to basically quit, and go look for another job?) But that’s what happens. Cronauer becomes the new teacher of the class. He teaches the students American slang, (think Terminator 2, with John Connor teaching robot Schwarzenegger how to speak on the streets.) Cronauer does this all in order to pursue a girl. But there’s a conflict. The girl’s younger brother is in the class, and he is very overprotective. Cronauer knows that the only way to get the girl is to win over her brother, and so he starts inviting the brother out. This ends up leading to more problems than he expected. When to American soldiers see the Vietnamese boy in a restaurant, they start harassing him. Cronauer gets involved and it leads to a fight. That’s the first strike. The superior officers want Cronauer thrown out, but the general lets it slide. Things only get worse. Cronauer goes to his favorite restaurant one day, and is pulled out by his friend, (the girl’s brother,) just in time. A bomb goes off and blows the whole place up. Angry about this, Cronauer goes on the air with some news that he wrote himself, about what happened. The protocol is that there are two guys, (twins, ironically the guys who played prison guards in Terminator 2,) who are censors. Cronauer is supposed to show them the news that he will be reporting, and then they go through it with red markers, crossing things out that he is not allowed to say. Only this time, he bypasses them and goes on the air without checking his news. When he is confronted by Dickerson, before going on the air, Cronauer locks Dickerson out of the studio and then proceeds with his report. This stunt gets him suspended from work. It also leads to Hauk taking over and trying to replace Cronauer. This situation leads to some very funny scenes where Hauk thinks he has what it takes and is proven dead wrong. All the men at the station who have befriended Cronauer, (from Forest Whitaker to Robert Wuhl,) try to tell Hauk that he’s just not funny, only Hauk’s not listening. He goes on and does his act, which includes a squeeze-honking horn. It’s terrible. And then we get to see Hauk try to explain himself to the General, who’s not interested in hearing any of it. Meanwhile, Cronauer is dealing with his own things, including coming face to face with his listeners, as a truck load of soldiers pulls up next to them. He talks with them and learns pretty quickly, what an inspiration he is to the men. He makes them laugh and they love them for it. And that leads us to the climax and one last situation of Cronauer getting in trouble. This one is the worst yet, and involves the girl he’s been pursuing and her brother. it’s a great way of bridging the two stories together, and it works to provide and lead us into a satisfying and unpredictable conclusion. The movie might feel like the usual formulaic thing at times, but it is certainly Williams showcasing his talent, and a story that ends up going in some very unexpected directions.